Gum disease is an infection of the tissues that hold your teeth in place. As plaque builds up at the base of the tooth, it can begin to grow beneath the gum line. Over time, untreated gum disease can cause permanent damage to the gum tissue and may even result in tooth loss. There are two primary types of gum disease. The first — gingivitis — is milder. You may have gingivitis without any discomfort or noticeable symptoms. This is why it’s important to see your dentist on a regular basis. Though you may not see the signs of gum disease, the professional providers in our network will. Periodontitis is a more severe form of gum disease that may develop when gingivitis goes untreated. Gum disease is caused by plaque buildup that typically results from poor oral hygiene. The most effective way to prevent gum disease is by brushing at least twice a day and flossing regularly. This will remove plaque from your teeth. You should also see your dentist at least twice a year for a professional cleaning. During this appointment, your dentist will remove both plaque and a form of hardened plaque known as tartar. Tartar cannot be removed by at-home brushing and flossing. Medications that reduce saliva production. Since gum disease takes time to develop, it’s naturally more prevalent in older Canadians. As you get older, this is something you should be particularly mindful of. Roughly 20 per cent of individuals have undiagnosed gum disease. Treatment for gum disease is more difficult as the condition progresses. The sooner your gum disease is diagnosed, the better your chances of resolving the problem. Bleeding gums, particularly when you brush. If you experience any of these problems, you should see a dentist right away. We have an extensive network of providers who can give you the care you need to restore your gums to a healthy state. Brush less than twice a day. Practice improper brushing and flossing techniques. Don’t consume enough Vitamin C.
Use a toothbrush that’s too hard. Rinse with water only, instead of an antiseptic rinse. Changing your habits in these areas can lead to better dental health. This is particularly important for seniors. Poor dental health doesn’t only impact your teeth. It can have an effect on other parts of your body as well. Untreated gum disease can lead to bone loss around the teeth. This is why gum disease is the leading cause of tooth loss. Seniors who have lost some or all of their teeth may face myriad struggles. Although there are many options, such as implants and dentures, to help you compensate for lost teeth, these can come with high costs and potentially painful procedures. The best way to preserve your ability to eat, talk, and smile comfortably is to take good care of your teeth. Gum disease is also linked to many other health problems. If you have a weak immune system, the bacteria in your mouth can travel to other parts of the body and increase your risk of heart disease or stroke. In some cases, infection of the tooth can lead to an infection of the heart’s lining. If you have diabetes, gum disease can make this condition worse. Luckily for you, there are several ways of reducing your chance of having gum disease as you age. Consult your dentists on a good technique to use when brushing. The technique and consistency of your brushing are important to your oral health. One way to reduce your chances of having gum disease is to brush at the 45 degree angle to your gums and brush in short, circular movements. Visit your dentist at least twice a year for regular checkup and cleaning appointments. If you already have gingivitis, you may have to visit your dentist every three to four months for a cleaning. Regular cleanings and checkups allow your hygienist and dentist to thoroughly clean the plaque and tarter from your teeth, which reduces your chances of having gum disease. Floss your teeth regularly to clean the spaces in between your teeth as plaque can easily get stuck in between your teeth, which can lead to oral health concerns like gum disease. If you have trouble using the floss, let your dentist know and they would be able to recommend alternatives for you. If you have any questions or concerns about gum disease, visit your dentist to discuss. 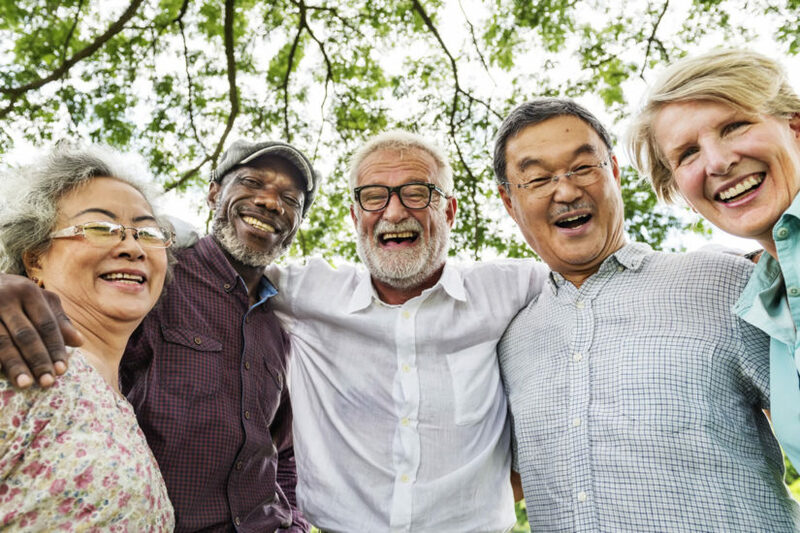 There are many treatment options for gum disease in seniors that can help you manage this condition and minimize the long-term damage. Always schedule regular appointments with your dentist to screen properly for gum disease. If you start to notice symptoms of gum disease between regular cleanings, make an appointment to have this problem addressed right away, so you can catch it early and prevent further complications.